What Does it Mean if There’s Smoke Coming Out of My Tailpipe? You’re driving down the road, and you start to notice some smoke coming from your tailpipes. Is this a big deal? In a word: Maybe. You definitely want to have it checked out ASAP. Not to be dramatic, but a smoking tailpipe could be a sign of a serious, impending failure. For that reason, you don't want to ignore it or hope it will "go away on its' own." Contaminated fuel. Sometimes, normal engine wear leads to a little oil seeping past the rings and seals and contaminating the fuel your vehicle burns. This will produce blue smoke. Other times, engine coolant has gotten into the cylinder, and it's burned off as white smoke. 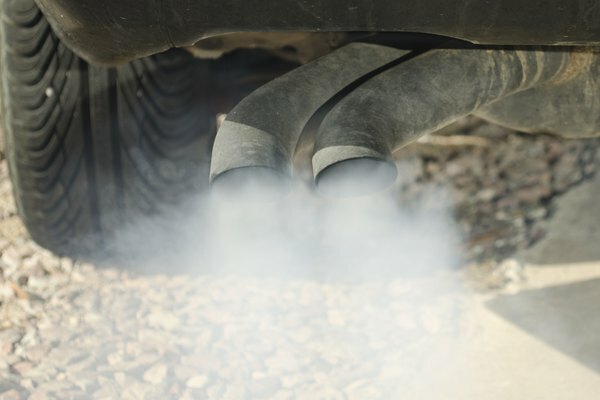 Either way, tailpipe smoke can indicate your engine is burning something it shouldn't be. That's bad for the air and - if ignored - bad for your wallet too. The earlier the cause is determined, the less expensive the problem is to solve. There’s a fuel issue. To much or too little fuel can lead to engine smoking. Both problems have serious potential side effects. Something is leaking into or onto the exhaust manifold or exhaust system. This is a very serious problem, as fluid leaking onto a hot exhaust manifold can lead to a vehicle fire. Get your vehicle to your local Toyota dealership or repair shop right away to get it checked out. If your vehicle needs repair, make sure you're getting OE replacement parts for factory fit and quality.